A cold house is often an uncomfortable one however with Sprayseal’s warm roof insulation you can drastically improve your homes heating levels. Our insulation can help reduce heat loss by as much as 90% and keeps your home warm in winter while cool in the summer. 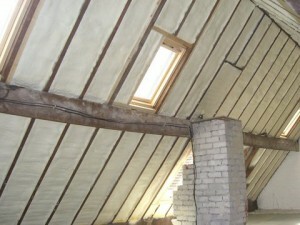 Research also shows that loft insulation can reduce home energy bills by many hundreds of pounds each year. 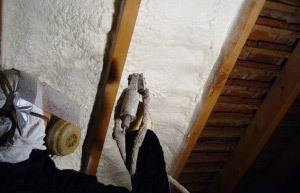 To improve the conditions within your home we use spray foam insulation which forms a rigid barrier between the internal and external elements of your roof. This warm roof insulation is now the industry standard and improves the energy efficiency certification of a home. It can also be installed with minimum fuss. There is no best time to install insulation as it improves your living conditions all year round. By this we mean there is no need to wait till early winter to have it installed as it will improve living conditions instantly. Alternatively you might be thinking that you could just upgrade your existing insulation however many of the old warm roof insulation types are far less effective than the new ones. If you would like to receive an obligation free quote then please click the quote button below and fill out the form. 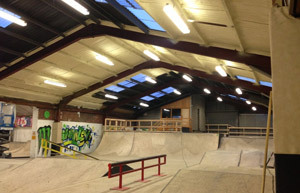 We aim to respond to all enquiries within 24 hours.